Present state: The degraded access footpath and some timber from the roadside gate survive. The trackbed is partially overgrown; there is no evidence of the timber platform facing. Some brickwork for the partially demolished and buried road bridge is visible. Notes: Worlington, once in Lackford Hundred, with a known history dating back to the eleventh century, is a pleasant village situated about one mile west-south-west of Mildenhall and on the heathland of what, since 1974, is known as the Forest Heath administrative district of Suffolk. The district embraces the towns of Newmarket, Mildenhall and Brandon with the Forest part of the title alluding to Thetford Forest which spreads across the border from Norfolk into Suffolk. Worlington has a current population of some 375 (Source: Worlington Parish Council. Figures vary greatly according to source) and is situated on the B1102 road and on the south bank of the River Lark. As with Isleham, the river was once the main source of goods transport for the village and incoming goods included hops and barley for the local maltings. This building still stands today. Other industries once included gravel pits, a cooper (barrel maker) and a blacksmith. Like so many other locations, at the time of writing Worlington lacks any form of shop but does have a pub/restaurant and other social and sports activities including a cricket club. The village is perhaps best known for the Royal Worlington & Newmarket Golf Club, located on the south-east edge of the village. It is a world renowned 9 hole course which can apparently also be played as an 18 hole course by means of alternative tees but it must be stressed that your author is no expert on golf. The course, which is the home course of Cambridge University, was founded in 1893 and permission was granted to include 'Royal' in its title in 1895. The Prince of Wales feathers are thus included in the club's logo. This refers to Prince Albert, of course, Prince Consort and husband of HM Queen Victoria. The club is located on Golf Links Road, which separates the course from the clubhouse. The description ‘links’ for an inland golf course is unusual, the term generally being applied to coastal locations. Golf Links Road joins the Worlington - Red Lodge - Kentford road immediately south of the railway bridge at which was located Worlington Golf Links Halt. Red Lodge, incidentally, is located on the old A11 Newmarket - Norwich road (it is now bypassed) and following WWII and until relatively recent times was the location of a large number of old railway carriage bodies converted into bungalows. Some bungalows consisted of just one carriage body, others consisted of two joined side by side. They were clearly visible from the old A11 and the majority were well maintained with pleasant gardens. It is thought none now exist as Red Lodge today has a large number of modern, permanent, residences. For railway historians Red Lodge was something of a gem and little known outside of East Anglia. The railway eventually arrived at Mildenhall in 1885, passing the south end of Worlington village on the way. Ironically, Worlington village was less than one mile from Mildenhall station via what is now the B1102 and that is a shorter distance than other branch stations were from the villages they were built to serve. During construction the contractor, Lovatt, had his base at Worlington but precisely where is not known. It would not have been near the site of the future halt as that was in a cutting but would have been where the track was at ground level and probably near a road. Most equipment and materials were, however, delivered by rail to Fordham and forwarded initially by road and later by the contractor's own trains. On the Barnwell - Fordham section the contractor set up his base near Swaffham Prior. The Great Eastern Railway opened Mildenhall Golf Links Halt on 20 November 1922; one of three halts opened on that day in an attempt to attract extra revenue in the face of increasing road competition and, in the case of Mildenhall Golf, to cash in on business to the golf club. This was during a period of economy measures being implemented along the Mildenhall branch, so the GER must be given credit for looking at ways of increasing revenue rather than merely settling for cost-cutting initiatives. However, until DMUs and railbuses appeared on the branch a large number of hauled coaches were converted over a period of time to serve the halts, and in view of the cost of this it is doubtful if the three halts every justified themselves. Details of the rolling stock converted to serve the halts can be found in the Branch History and also in the Cambridge Feature. It is not known if the golf club originally had Mildenhall in its title but it appears not. The name 'Mildenhall Golf', just those two words, appeared on the destination boards affixed to the side of the 6-wheel conductor-guard stock so it is reasonable to assume that the halt nameboard also included the name 'Mildenhall'. 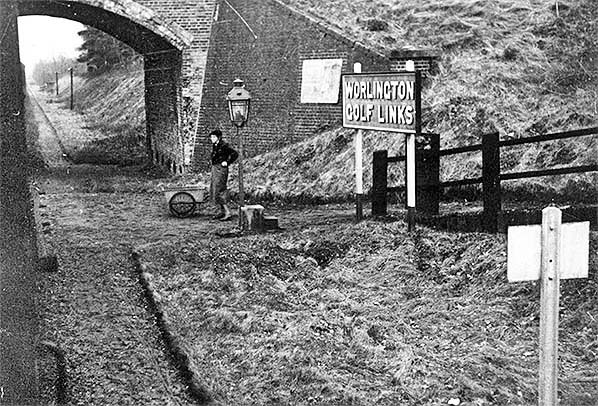 In any event, just a few weeks following opening the LNER renamed the halt to its more familiar name, Worlington Golf Links Halt, on 1 January 1923. This date was the first day of The Grouping and therefore the first day of the LNER's existence. The renaming would thus have been planned by the GER and as these things cannot be done on a whim - they all have to go before various committees and be approved - so the renaming was likely planned immediately after the halt opened. This in turn suggests 'Mildenhall Golf Links Halt' was an error. Such errors were not uncommon and surviving GER records contain several, some of them bearing little resemblance to the correct name and thus difficult to work out. The three Mildenhall branch halts, the others being Exning Road and Fen Ditton, all opened on the same day (and closed on the same day, 18 June 1962) and were identical in respect of general layout. All were on the up side of the line and on the Cambridge side of their adjacent road bridges. 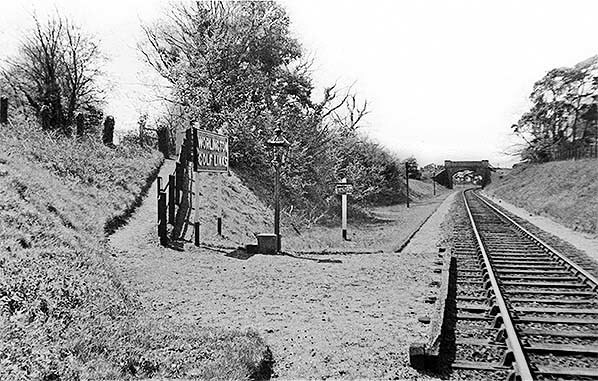 All three were provided with an access pathway cut obliquely into the road bridge approach embankment, a low cinder platform 30ft long and faced with old sleepers (the latter at Fen Ditton, at least, appeared subsequent to opening), a nameboard and an oil lamp. It was the job of train guards to attend the oil lamps at the halts and it has been said that Tilley lamps later replaced the original lamps. However, anybody who knows how to start a Tilley lamp (see Fen Ditton Halt page) will understand how impractical the use of these lamps at unmanned halts would be. Worlington Golf Links Halt, 19m 68ch from Cambridge and within sight of Mildenhall station, was the most used of the three halts. This is not surprising given its convenient siting for both the village and the golf course. Even so, readers should not conjure up visions of crowds of passengers stumbling down the embankment to the halt. Often there would not be a single passenger for several days and when diesel multiple units and railbuses appeared it became the practice simply not to bother stopping at the halts. With DMUs and railbuses, communication between driver and guard was possible via a number of means. If no passengers wished to alight the guard would inform the driver accordingly. The driver would then slow the train, have a good look and if no intending passengers were waiting, or hurrying along the road waving, the train would not bother stopping. What about lighting the oil lamps? Well, the level of service, especially in later years, meant that the lamps were needed only during the shorter daylight hours of winter. Indeed, many photographs of the halts show no lamp to be present at all. As can be determined from pictures of all three Mildenhall branch halts, one had to be reasonably agile to use them. The pathways down the embankments were steep and very probably slippery in wet, frosty or icy conditions while the steps, retractable or portable, had to be clambered up or down whilst holding the grab rails on the side of the carriages. The halts were certainly not friendly towards the elderly, people loaded up with shopping, people with perambulators and the physically disabled who would have found the halts virtually impossible to use. But then, as in so many aspects of life, it was a different world over half a century ago. There was no obsession with Health & Safety, no disability discrimination laws, no 'compensation culture': people just got on with life as best they could and seldom made any great fuss. 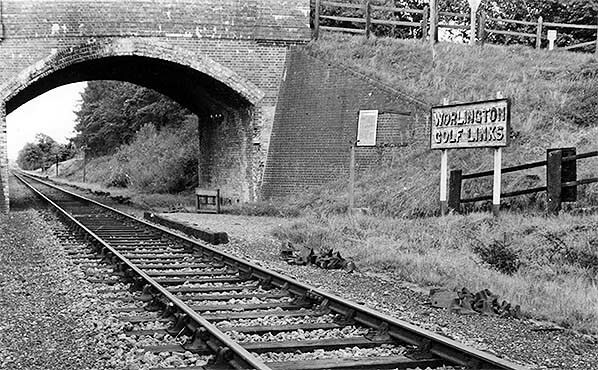 After final closure of the Fordham - Mildenhall section in 1964 bridge 2257, that at Worlington Golf Links Halt, was partially demolished and the gap infilled. The railway was in a cutting at this point so the work was not as drastic as at other locations along the branch. As a result, Worlington Golf Links is the only one of three halts of which some remains can still be seen as of May 2015 - providing one is kitted out for a jungle expedition and knows precisely where to look. An amusing little anecdote exists concerning Worlington Golf Links and the railway. 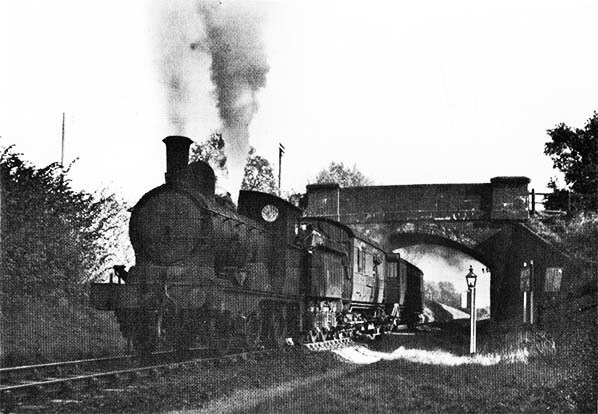 It is said that golfers who had boarded a train at Mildenhall would drop their clubs out of the window as the train was passing the course and was slowing for the halt. Golfers would alight at the halt then walk back along the track to pick up their clubs before hopping over the fence onto the golf course. The idea was apparently to avoid the need to carry the clubs from the halt to the golf course. For a number of reasons this story seems extremely unlikely so is probably a myth created by a few merry chaps at the nineteenth hole. Anybody wishing to make the journey by rail today and perhaps play a round or two of golf should purchase a ticket to Kennett.......and be prepared for a four mile walk. In addition to the images below, an image of Worlington Golf LInks Halt on the final day of passenger services can be seen on the Last Train to Mildenhall page. Tickets from Michael Stewart and David Pearson. Route map drawn by Alan Young. Bradshaw from Alan Young. A neat and tidy Worlington is seen here in 1953. Bridge 2257, a skew bridge, is immediately behind the photographer who is looking towards Isleham. The bridge in the distance is 2256, Manor Farm occupation bridge; 'occupation' means, in a nutshell, non-public and usually alludes to a farm track or other form of private access. Because bridges on the branch were built to span any future double track, this view is a little deceptive as, at first glance, it appears that the track curves away to the right of the bridge. The curve is the start of the somewhat sinuous section between Worlington and Isleham. Note the well maintained permanent way; this was typical of even the most rural of branch lines. It not only looked good but served a specific purpose: the prevention of weeds and undergrowth interfering with track drainage. Trees and bushes were also kept pruned back from the track as this helped prevent the 'leaves on the line' problem, that very real problem affecting steel wheels on steel rails at which the ignorant media delight in poking fun. As far as the halt is concerned, and despite the general neatness, it appears that the cinder 'platform' could do with topping up as its edging is standing quite proud of the ground. The access path was not as steep and long as those at the other halts. The road is behind the fencing at top left. The sign on the white post is a trespass warning. Such a notice stood sentinel at all the halts but positioning varied. At Fen Ditton, for example, it was beneath the bridge. The steps at the base of the oil lamp are not those for gaining access to trains; these did not appear for a further four years. Those seen will be for assisting with maintenance of the lamp. Worlington village and halt shown on a 1955 1:25,000 map. The River Lark can be seen at the top of the map and Mildenhall is off the map to the right. The road heading south-east from the halt is Golf Links Road and the course itself is between that road and the railway line, while the clubhouse is the building south of the road and to the right of Coldwell Farm. The convenient siting of the halt for both the golf club and the village is apparent. The halt is not shown on any 1:2,500 maps. A Mildenhall train, either to Newmarket or Cambridge, is picking up a passenger at Worlington, by means of the retractable steps, sometime in the early 1950s. The steps were operated by the guard from within the brake third carriage. It is not known if it is the guard looking out of the window of the brake compartment. Passengers boarding at the halts, or Quy in later years, would purchase their tickets from the guard but those travelling to a halt from a conventional station would purchase tickets in the normal way. The type of ticket issued by guards is not known. A number of tickets to the halts have survived but, at the time of writing, none issued from a halt have come to light. A poor quality photograph has survived from around the time that the halts opened showing a guard with a wooden ticket rack similar to those once used by omnibus and tramcar conductors. This suggests card or heavy paper tickets but no definite information is available. Otherwise tickets issued at branch stations, including to the halts, were of the standard Edmondson type. The locomotive is a Class E4 2-4-0 and appears to be one of those fitted with a side window cab. Six of the class were sent north c1936 to work on, among other routes, the Stainmore line, a wild and lonely place, and fitted with side window cabs to help counter the winter weather conditions. When they returned south, the modified cabs were retained. The locomotives involved became BR 62781/4/8/93/5/7. Of those, 62781/4/8 are known to have worked the Mildenhall branch and the other three may have done at some point. Of the three definites, 62781 was a regular and was photographed on a number of occasions on the branch. 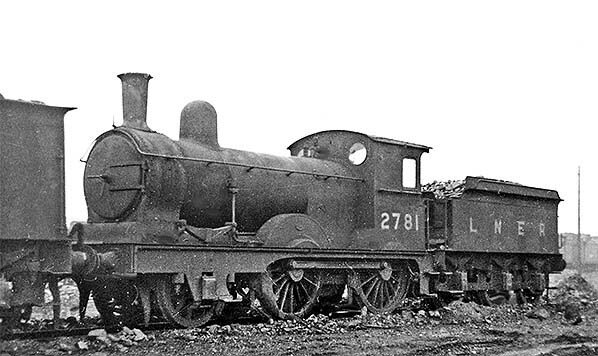 Just for interest, here is LNER 2781, later BR 62781, awaiting works attention at Stratford on 18 January 1947 and showing off her side window cab. New in November 1900, she was withdrawn from 31A, Cambridge shed, in January 1956. Worlington Golf Links Halt looking towards Mildenhall. 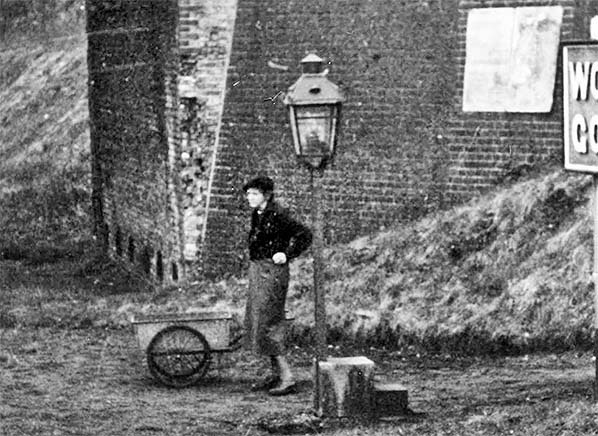 The photograph came undated but as the portable steps are present we know it is after 1957. The rail chairs lying beside the track tell us that engineering work is ongoing, and this work is known to have been undertaken in September 1961 so we can say the photograph dates from that time. It is often erroneously thought that the steps appeared with the introduction of DMUs and railbuses, but this was not the case. The steps were introduced following withdrawal of the ex-GER stock as not all of the replacement Gresley brake thirds were fitted with retractable steps. Possibly this was because of the pending introduction of the diesels into passenger service in 1958. DMUs had actually been seen on the branch from 20 November 1955 but only for timing trials. Curiously the two units involved, E79047/263 and E79051/278, have been recorded as going new from Metro-Cammell's works at Birmingham direct to Norwich in January 1956, but this was not true. They also ran timing trials on the ex-LNWR route from Cambridge and, it is believed, the Stour Valley line. Up on the road, one of once familiar diamond shaped notices warning of weight limits can just be seen. The white dots beneath the bridge arch are insulators for telegraph wires. Today these can still occasionally be seen fixed to bridges over abandoned railways or, if one is determined enough, found lying discarded in the undergrowth. At High Ditch Road, near Fen Ditton, the extant (in 2015) bridge still has the mounting bracket for the insulators, if not the insulators themselves. A notice board is seen fixed to the fence to the right of the station sign. 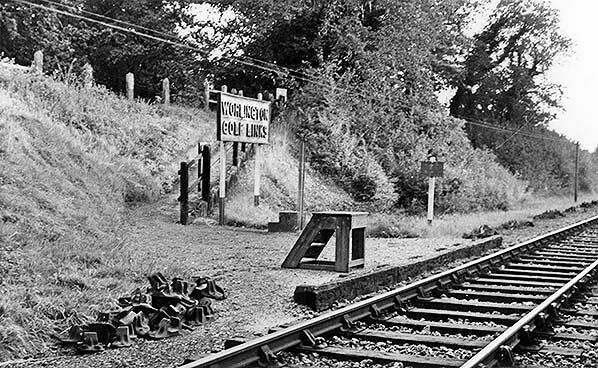 The halt in September 1961. On this occasion the portable steps have been positioned on the 'platform'. Note the lamp is absent; in September it would be daylight when the first train of the day called at Worlington at 7.37am and, if early in the month, sunset as the final train of the day called at 7.34pm. At this time, repairs and maintenance to track, especially on branch lines, would be undertaken by the local PW gang using little more than hand tools and sheer hard work. Other photographs taken at this time show a large quantity of chairs alongside the track stretching some distance either side of the halt. This would suggest that an engineering train, rather than just a PW trolley, had visited the line, and probably on a Sunday.